Pam's Eclectic Stuff: 7th Bead Soup Blog Party -- FIRST REVEAL! Hello everybody! I am so excited, it is time for me to show you what I made with my bead soup in Lori Anderson's fun Bead Soup Party!!! I am part of the first reveal group. 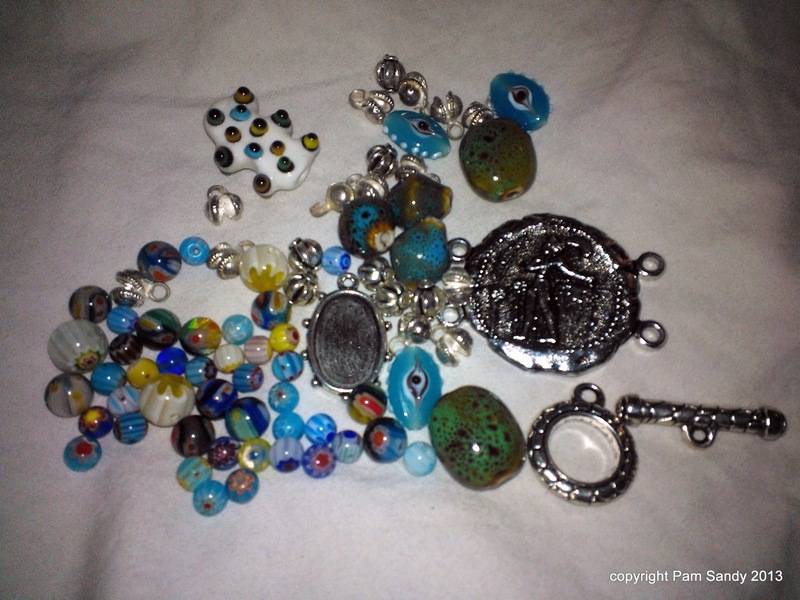 It was a colorful mixture of milifloral glass beads, other glass beads, some ceramic beads, and a few metal components, including a piece from an old bracelet. 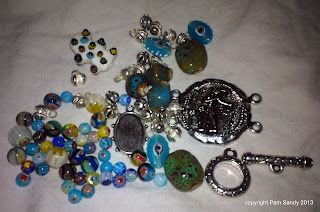 I sent Grace some various pearl, glass, porcelain, and shell beads, with some vintage earrings thrown in for fun. 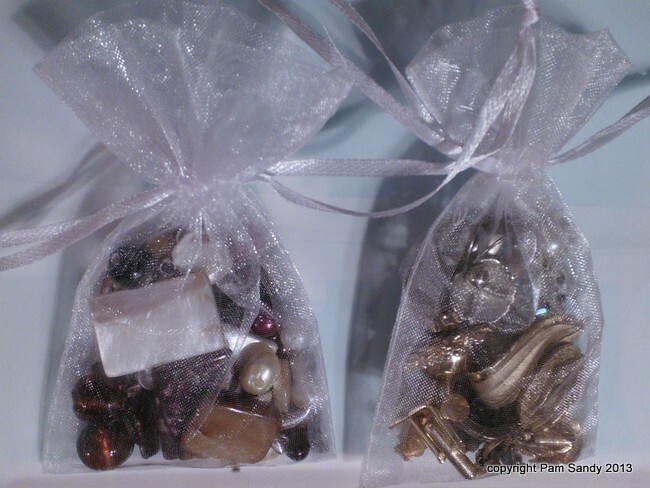 I love to cut up vintage earrings and incorporate them into mixed media projects and jewelry, and since Grace makes beautiful steampunk style jewelry I thought she might be able to do the same. Can't wait to see what she creates! Bead Soup Party 1st Reveal! Please be sure to check out the beautiful creations that others have made. 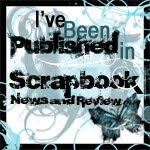 I love to hear from you, so be sure to leave me a comment or follow my blog. I will repay the favor! Happy browsing and beading! That bracelet is SWEET! I love it, and I'm sure your friend will, too! The bracelet in particular I really like. A great design to really put the focus on the focal you were sent. very nice designs - love the bracelet! That bracelet is so beautiful, great job. I love the simplicity of the necklace, love the focal bead and the earrings are super cute. Great job! Very creative soup Pam! Love what you did with your necklace. yummy soup! Great jewelry! Love the bracelet!!! You made some very nice pieces with your soup. I really like the wire work you did on the bracelet. I love the wire work! The bracelet came out especially well. Wow, everything is so pretty, but that bracelet totally rocks! You made an amazing job, all beautiful pieces! wow wow wow.... that bracelet is amazing. love it. What an awesome job on all the designs! Look at that Bracelet! Love your work. I really like the way the bracelet came out. What techniques did you use? It looks great! Very pretty bracelet! Other designs are nice too! i love what you came up with!! You are a very talented jewelry artist-love the bracelet. Thank you for sharing. Ooooh!!! I love the bracelet you made! What a creative way to feature the coin in the bracelet. Very nice. The wire work is great. I liked your Soup ingredients and even more I loved what you made from them. Happy Creating! Nice sense of movement with all the wire swirls - and the colors are all so happy! what a great wire work! i admire! I especially like the bracelet. Well done! Your jewelry set is beautiful. Good job using your soup Pam. What a beautiful set you created! Interesting and amazing as well. Gorgeous. I really like how each piece complements the others. Nice designs. Your bracelet ROCKS! Great work! Very pretty pieces...I love the bracelet! Your set came out so fanciful with all the frilliness that your wirework added to it I'm sure your friend LOVED it. Nice job!